Quaint Georgia Cottage w/Deck on Lake Champlain! Escape to Northern Vermont and stay in this charming 1-bedroom, 1-bathroom vacation rental cottage on Lake Champlain. 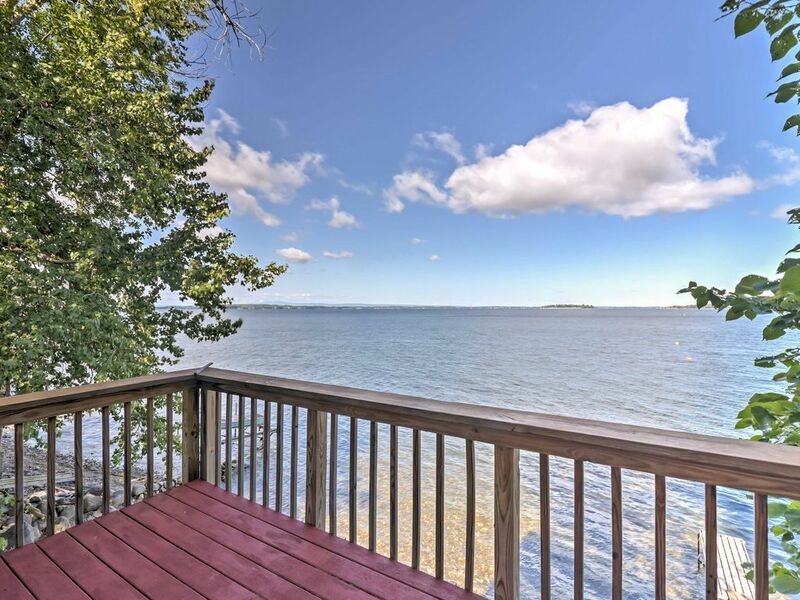 Comfortably sleeping 2 guests, this home is perfect for a romantic getaway on the water. Georgia is a quiet town that ensures a peaceful escape from the stresses of everyday life. Have an intimate dinner overlooking the lake or make a fire and sit by the shore while you reconnect with that special someone. Stunning views of the lake can be seen from anywhere in the house, with a plethora of windows allowing natural light to fill the room. Lay back in the plush recliners and watch the sunset light up the sky. The well-equipped kitchenette makes cooking at home simple with a hot plate, microwave, and full-size refrigerator. Set the dining table for 2 and have a romantic dinner with your significant other. Step out to the side deck and cuddle up on the rattan furniture for some fresh air. Walk down to the shale beach and cool off with a refreshing swim in the lake. At night, start the fire pit and take a seat in the outdoor chairs for a serene evening. When your eyes get heavy, head to the bedroom and fall back onto the soft king-sized bed. The room also has a private deck with rocking chairs and breathtaking views. Dive into the rich history of the area when you visit the home of Chester A. Arthur, our 21st president. You can also see a historic log cabin that was built in 1783 by Jedediah Hyde Jr. For even more historical artifacts, be sure to check out Saint Albans Museum. Head to Shelburne for the day and stop by the museum to immerse yourself in Americana art and design or stop by Shelburne Farms for a fun, interactive lesson in sustainability. Go for a romantic hike in Niquette Bay State Park, a 584-acre park where you can also fish and swim in the lake. Do your best to spot the local wildlife in the Missisquoi National Wildlife Refuge. This wetland habitat supports a variety of migratory birds including the Bald Eagle. For a little more action during your vacation, take a 35-minute drive to Burlington. Visit a myriad of local breweries and boutique shops at the Church Street Marketplace. For fun closer to home, drive 10 minutes to Saint Albans City for cafes, shopping, and a local marketplace. - Waterfront Georgia location on Lake Champlain - A private getaway, close to Burlington, historical homes, museums, hiking, fishing, shopping, restaurants, breweries, and more! We had one of the best vacations ever in this quiet little cottage directly on the shore of Lake Champlain! The property was newly renovated, clean, and very much as described in the listing. The owners live on the other side of the house and are attentive without being obtrusive. There was ample parking across the street for our car and boat trailer. We launched our boat at the Van Everest public put-in about 3 miles south in Milton, VT. We anchored it right off the beach for the week, and it was wonderful to be able to use it whenever we wanted with no hassle. My husband and I love to fish, and all we wanted out of this vacation was a chance to do that as much as possible. We easily caught over 100 fish each during the span of our week at the cottage. The lake has abundant yellow perch and smallmouth bass, and we also caught a few other species. We spent 4 hours on a guided fishing trip out of Shelburne, VT, just south of Burlington. It's called "Sure Strike Charters" for anyone interested in catching a bunch of enormous lake trout, which we certainly did! My largest was 32 inches! We spent a day in Montreal, an easy drive of 1.5 hours from the cottage. We also spent some time walking around Burlington. Both day trips were fabulous. But we were really there to enjoy the lake, and to unwind from stressful jobs. It was magical. We cooked dinners on the grill on the deck, and enjoyed cocktails as we watched the sun set over the lake against the backdrop of the mountains. We brought binoculars and enjoyed watching a huge variety of birds. The lake in this part of VT is very pristine and sparsely populated, so we did not have the usual aggravations of tons of jet skis, trash, loud music, etc. that you often find at lakes. It was so quiet and unspoiled. Swimming was "ok" but not great. The water is a perfect temperature in August, but the beach is rocky (water shoes are a must!) and there is considerable algae/weed. But that is what most lakes are like. There is no AC and you don't need it! The cottage gets a lovely breeze off the lake, and has good cross-ventilation. We slept really well on a comfortable bed with the fresh air and the sounds of loons, gulls, and waves lapping. It was heaven. The only downside--which I emphasize was minor--was the well water. Like many homes on the lake, there is sulphur in the water so you will want to drink bottled water. It's not harmful--just unpleasant smelling when you shower. All in all, 5 stars! We'll return!